Beata Mariana de Jesus Mejia-Mejia, second from left, rubs her son Darwin Micheal Mejia's chin as she speaks at a news conference following their reunion at Baltimore-Washington International Airport, in Linthicum, Maryland, June 22, 2018. U.S. President Donald Trump told federal agencies Thursday to not separate immigrant families after they illegally cross into the country from Mexico. "We want to put them together," Trump said during a Cabinet meeting Thursday while the first lady, Melania Trump, was visiting a detention center for migrant children in McAllen, Texas. However, there appeared to be no immediate plan in place to reunite the more than 2,300 children already separated from their families since April -- igniting a fresh controversy over the conditions in which the children are living. 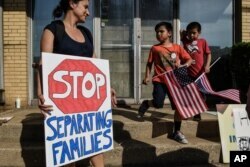 This would be "an even more clear signal that the whole purpose of bringing these prosecutions is to separate parents from children and not about enforcing the law," David Bier, immigration policy analyst at the libertarian Cato Institute, told VOA. The Trump administration's policy has required that anyone who crosses the border illegally face criminal charges. "If it continues to be the case that some of these cases or many of them are dismissed by courts, that should be the end of the policy," added Bier. 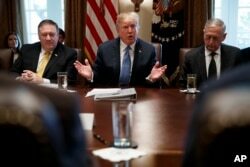 Secretary of State Mike Pompeo, left, and Secretary of Defense Jim Mattis, right, listen as President Donald Trump speaks during a Cabinet meeting at the White House, June 21, 2018, in Washington. "The whole world is laughing at us and has for years," Trump said. The president explained that what he had signed the day before was "a good executive order but it’s limited no matter how you cut it," necessitating quick legislative action. "The only real solution is to come together to close the catch-and-release loopholes," said Trump. "If we don’t close those loopholes, there’s no amount of money that can solve this crisis."